By invoking the black radical intellectual tradition of W. E. B. Du Bois, Eric Williams, Walter Rodney, C. L. R. James, Angela Davis, and Cedric Robinson, Johnson counters the subterranean creep into historical scholarship of liberal notions of justice. In its place Johnson proposes an alternate genealogy in which the original sins of indigenous land seizure and the Atlantic slave trade served as the genesis of global capitalism. 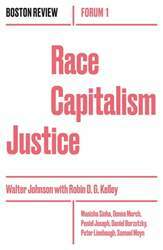 Calling on historians to revisit and expand their understanding of primitive accumulation, Johnson explains, “Rather than asking over and over what Marx said about slavery, we should follow Robinson in asking what slavery says about Marx.” He laments that slavery remains insufficiently integrated into the history of capitalism, just as the historical experience of enslaved people themselves has become marginalized in some of the most elite academic circles.